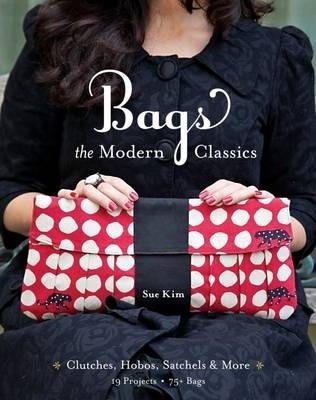 Sue Kim has been designing sought-after creative sewing patterns for many years. She lives in Manitoba, Canada, with her three lovely children and husband. Sue shares her patterns and creativity on her popular website, ithinksew.com. She started sewing when she was ten years old and has always had a passion for crafts. She earned a master's degree in ancient Asian theater. However, she kept sewing and designing as a hobby until, luckily, she was asked to be a sewing instructor at a Jo-Ann Fabric and Craft store. That expanded into requests to teach in several quilt shops. The quilt shop owners also encouraged her to start her own pattern business. Her first patterns were for small bags and clutches, and eventually she was asked to make a pattern book of bags and clutches. Many of the patterns Sue sells are downloadable PDF patterns. She has completed several books of patterns and has become an independent pattern designer, writing for several publishers and pattern companies. Sue has countless ideas; her sketchbook is never empty.